Library image #3607: A river flowing through a steep-walled canyon. The United States Congress designated the Owyhee River Wilderness (map) in 2009 and it now has a total of 267,137 acres. All of this wilderness is located in Idaho and is managed by the Bureau of Land Management. The Owyhee River Wilderness is centered on the Owyhee River and its tributaries, in the southwest part of Idaho near the Oregon border. It is a land defined by rivers, cutting steep canyons out of high desert, and sagebrush plateaus which range from about 4,200 to 5,600 feet in elevation. It’s also a landscape lacking trails and only rough, non-wilderness roads to gain access to open land. Hiking cross-country — without trails — requires a focus on landmarks, a compass or GPS assisted sense of direction, a good map and an interest in scrambling. The attractions are many: fields of lupine, stark bitterroot flowers, cougars, bighorn lambs, prairie falcons, and pronghorn antelope. River enthusiasts come from around the country to challenge the famous white water rapids of these rivers. The area receives 4.25 inches of precipitation, annually. Summer temperatures typically range from 40 to 80 degrees F and 25 to 60 degrees in the spring and fall. Winters can become quite cold with average temperatures ranging from 15 to 35 degrees. 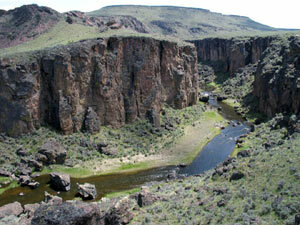 Planning to Visit the Owyhee River Wilderness? How to follow the seven standard Leave No Trace principles differs in different parts of the country (desert vs. Rocky Mountains). Click on any of the principles listed below to learn more about how they apply in the Owyhee River Wilderness.